“Lamat” formation in wheat at Etchilhampton Hill, near Devizes, Wiltshire, England, reported on August 15, 2006. Estimated diameter is about 300 feet. Aerial image © 2006 by Cropcircleconnector.com. Email from Australian scientist who requests anonymity: “Etchilhampton Hill seems to show some kind of space-time grid from general relativity. By that interpretation, its four-fold symmetric star-shape could be interpreted to illustrate a gravity-wave vibration, which has two degrees of freedom as “up-down” or “left-right” (that is, vertical or horizontal). Similarly the round white circle, which is shown below that four-fold star, could be meant to illustrate how space and time will vibrate due to a passing gravity wave, near an originally round planet such as Earth. Finally, its construction date of August 14, 2006 could possibly be one year before a real impact date of August 14, 2007, but only if the crop artists have a symbolic logic resembling our own, which is not certain. How might Etchilhampton Hill of August 2006 relate to previous Mayan-type crop pictures? Recall that Wayland’s Smithy of August 2005 showed two sets of base-16 hexadecimal numbers as “13-10-7” and “14-5-11”. To make this clear, let us show the latter calculation in detail. 14 /16 + 5 / (16*16 ) + 11 / (16*16*16) = 0.87500 + 0.01953 + 0.00269 = 0.89722, which is a fraction of 52 years between December 1960 and December 2012. Further calculations then show that 0.89722 x 52 = 46.655 years since the starting date of December 21-22, 1960. First we add 46 years to December 21-22, 1960 to get December 21-22, 2006. Next we add 0.655 years = 239 days to December 21-22, 2006 to get approximately August 15, 2007. The 52-year Mayan period represents a regular periodic motion of the Sun and Venus. One Mayan Sun equals exactly 5200 “years” of 360 days each (as shown at Silbury Hill in 2004). How do we know that the Mayan 52-year calendar, based on motions of the Sun and Venus through our sky, was the proper choice? Well, it was illustrated symbolically at Silbury Hill in August 2004; and a series of “Mayan glyphs” were shown around the outer part of Wayland’s Smithy in August 2005. Finally, the central “crescent” of Wayland’s Smithy 2005 showed only 15% remaining, which was nearly correct for August 2005 as a fraction of 52 years spanning 1960 to 2012. In other words, (2012-2005) / 52 = 7 / 52 = 0.134. Thus we see a strong logical connectivity of all three August patterns over three successive years from 2004 to 2006. 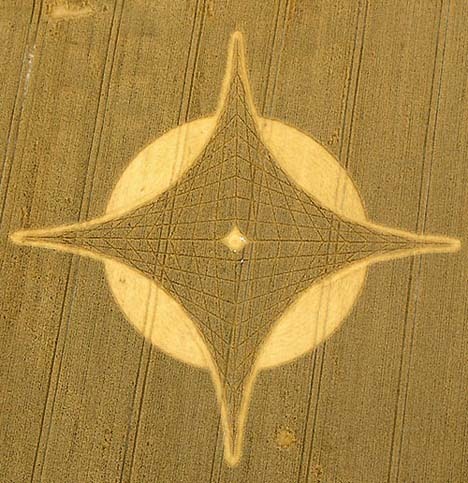 One of the most interesting aspects of this crop-circle logic is that those 52-year calendar periods refer to periodic motions of the Sun and Venus as seen from Earth, and not in a Sun-centered frame of reference. If they were not made by local human fakers (of a mathematical nature), then how could the crop artists possibly be ‘aliens’? They could instead be humans from our own past, or maybe from our own future? Time-travel through wormholes makes all things possible, even apparent contradictions involving causality. ‘You do not understand the basic nature of time. There is no present without the past, and no future without the present.’ Those words were written by Ursula LeGuin in her great novel The Dispossessed, where her character Shevek invents a new theory of time that makes faster-than-light communication possible. That was considered wildly speculative when she wrote the book, but today we call it ‘quantum teleportation,’ and it is discussed in leading scientific journals such as Nature. Who can say whether advanced scientists on Earth will eventually invent some new technology, which will enable them to send messages back in time, by making complex patterns in summer crops? We see motifs there which are all too human, and often not ‘alien’ at all: Celtic symbols, Buddhist symbols, Jewish symbols, or even highly-coded warnings about the near future. Simply by waiting for another 11 months, we should be able to learn whether those patterns are being made by local humans from our own time, or else by humans from some other reality? Ted Robertson, Harpsichord Maker and Independent Crop Circle Research Assoc. (ICCRA) Investigator, Indiana: “That particular star formation has been one of my favorites this year and just from the looks of it alone I thought it one that is probably authentic. It does look like Venus now that you mentioned it. The paths being so narrow and straight, so elegant and the design itself gives a “positive” feel to it. Another thing too is that for me the octave represents a completion and a resting point. This seems congruent with the Mayan symbol of eight the Lamat. The eight for a completion of scale containing only diatonic tones while the thirteen – also mentioned as the long count with 13 baktuns represent another way of looking at the harmonic scale when it includes all the half steps ( includes the non-diatonic notes as well). And so twelve different tones are the number of notes counted in a chromatic scale when on note thirteen one reaches the octave again. So both 8 and 13 represent to me completion ( the octave) where the notes counted end on an octave the first using the diatonic scale and the second using the chromatic scale. For further information about Mayan and Aztec-related crop formations, please see reports below in the Earthfiles Archives. For other crop formation images and information, please see Mysterious Lights and Crop Circles and Glimpses of Other Realities, Vol. I: Facts & Eyewitnesses in the Earthfiles Shop.